Other names: Forest satinash, lady apple. Red bush apple is a wild growing fruit from Northern Australia and Papua New Guinea. It is belied to have originated somewhere in this region only. 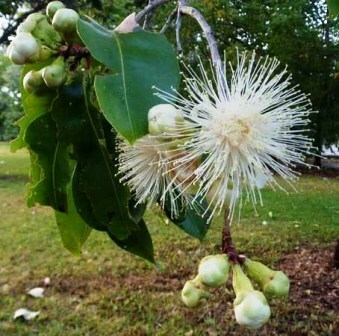 The fruits, which are of good quality, are eaten by aboriginals. These are, however, not yet sold commercially. 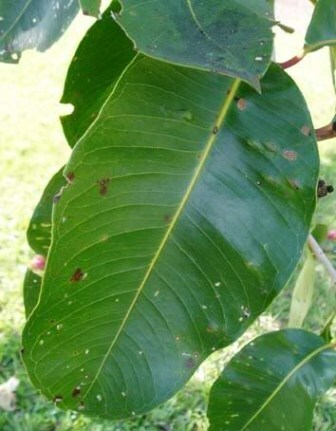 Leaves smooth, opposite, thick, leathery, variable in shape, orbicular, oblong, ovate, elliptical or lanceolate, usually quite large about 7-19 x 4-13 cm; petioles about 0.7-3.4 cm long; oil dots sparse to numerous; midrib slightly grooved, depressed or flush with the upper surface. Flowers white, calyx tube (hypanthium) + pedicel about 14-30 mm long, calyx tube (hypanthium) about 8-18 mm diam., calyx lobes rounded, dimorphic, inner larger, about 6-15 mm long, petals orbicular or oblong about 12-24 x 12-20 mm, oil dots numerous, more than 100 per petal; outer staminal filaments about 18-45 mm long, glandular, anthers about 1.1-2.1 x 0.4-0.7 mm, gland terminal, near the back of the anther; ovules about 25-65 per locule, placentas axile, central, ovules radiating, ascending; style about 20-55 mm long, approximating or exceeding the stamens. Fruits depressed globular, globular or ovoid, about 30-70 x 35-90 mm, often conspicuously longitudinally ribbed, calyx lobes persistent, about 6-13 mm long, red, fleshy. Red bush apple fruits are edible and eaten in very large quantities by the aboriginals. Their sharp pleasant tang of the fruits is very much appreciated by visitors too. The fruits are said to possess medicinal properties. The aborigines use the fruit for colds and chest congestion. They also squeeze the juice and pulp into their ears to relieve earache. 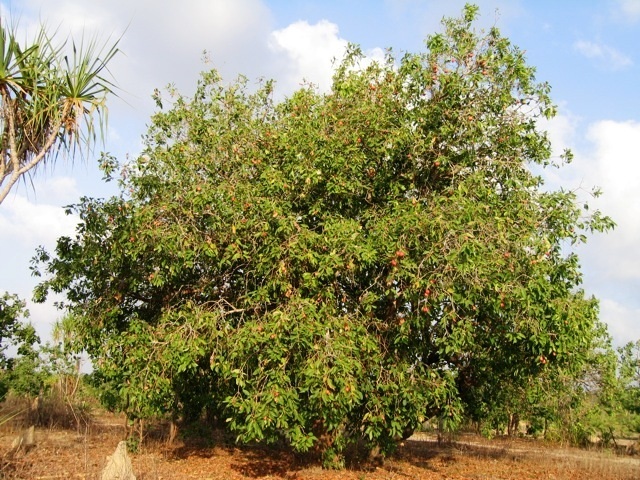 Red bush apple fruits are collected from the wild. 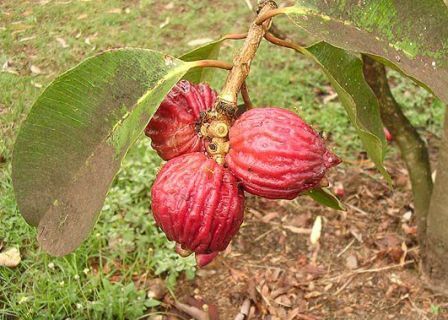 This fruit has still not brought under cultivation despite its popularity. However, the trees seem to be growing nicely on well drained or sandy tropical and woodland soils in the top end of Australia. New plants can be raised from seed.